Mourners gathered Saturday to bury their dead in southwest Pakistan after a blast killed 128 people at a political rally in one of the country?s deadliest attacks, underscoring ongoing security challenges following years of dramatic improvements. 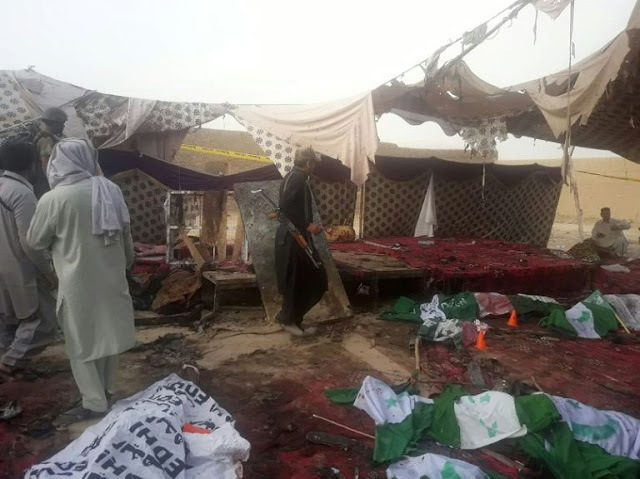 The Islamic State-claimed suicide attack in the town of Mastung, near the Balochistan provincial capital Quetta, was the latest in a series of bombings targeting campaign events in the last week, sparking fears of more violence ahead of nationwide polls on July 25. Hospitals in the area have been placed under "emergency" management after being overwhelmed yesterday, with around 150 also injured in the blast -- many of them still in critical condition after suffering head trauma. "We have imposed emergency in the hospitals and cancelled the vacations of the doctors and paramedics," Balochistan home minister Agha Umar Bungalzai told AFP. Among the dead was Siraj Raisani, who was running for a provincial seat with the newly-formed local Balochistan Awami Party (BAP). The BAP suspended campaign-related events on Saturday and has called for its supporters to observe three days of mourning. The attack was the deadliest since Taliban militants assaulted a school in the northwestern city of Peshawar in 2014, killing over 150 people, mostly children, and one of the deadliest in Pakistan's long struggle with militancy. The explosion in Mastung came hours after four people were killed and 39 injured when a bomb hidden inside a motorcycle detonated close to another politician's convoy in Bannu, near the border with Afghanistan. The politician -- Akram Khan Durrani, a candidate of the Muttahida Majlis-e-Amal (MMA) party -- survived. No group has yet claimed responsibility for that attack. And on Tuesday, a bomb claimed by the Pakistani Taliban targeted a rally by the Awami National Party (ANP) in the city of Peshawar. Local ANP leader Haroon Bilour was among the 22 killed. Following the attacks, analysts called for the country?s armed forces to focus on security challenges rather than politics, in the wake of myriad allegations that the military was meddling in the country?s upcoming polls. "It has never been truer than Pakistan's security establishment needs to focus on security, not politics," tweeted analyst Mosharraf Zaidi. In an editorial in the English daily Dawn, the newspaper called for authorities to "not only beef up security but also mobilise the entire intelligence apparatus to do the job they are actually meant to, ie preventing attacks". The bombings come at a moment of increasing political turmoil in Pakistan as former prime minister Nawaz Sharif was arrested after arriving in the eastern city of Lahore late Friday, as he aims to energise his embattled party's base -- injecting fresh uncertainty into the country days ahead of the polls.